Parental controls app to empower parents to limit when and how often their children’s phones can be used. Launched with Verizon and AT&T. Location Labs has been providing apps to all the major US phone carriers like Verizon, AT&T, T-Mobile, and Sprint since 2002. By 2016, a lot of these platforms were outdated and extremely difficult to update. AT&T’s platform allowed parents to locate their children and Verizon’s platform allowed for parental controls. Even though they had valuable features, we were facing stark competition which threatened our business contracts. The design team was asked to reimagine the platforms into one powerful app for families that would revive the product and win renewed carrier deals. With dynamic UI design, new features, and critical design thinking, we were able to win over Verizon and AT&T and put our company back on track. We needed to come up with a compelling and extensible product vision to win renewed contracts with our carrier partners. Our idea was to create an app that was more than a parental controls product but something that would serve the family as it evolved. I was able to help bring the product vision to life through my illustrations of the “highlight” cards, below. Verizon signed on and AT&T quickly followed. 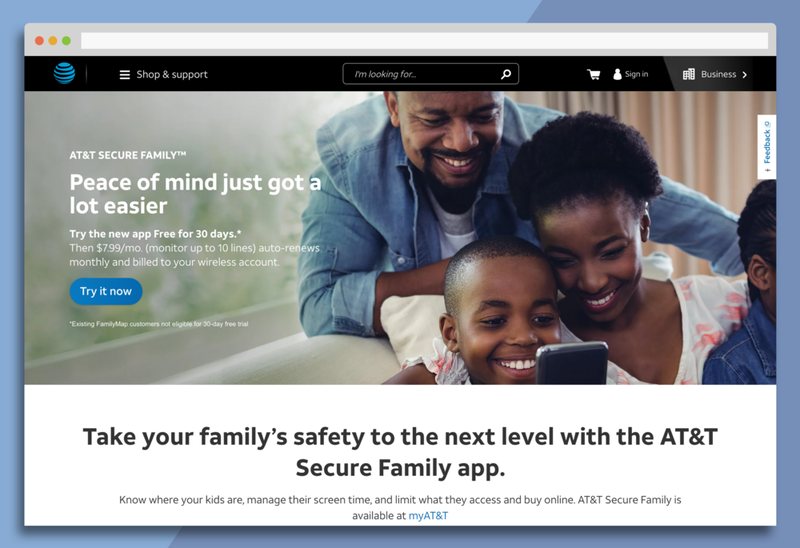 We had less than 6 months from start to launch for Verizon Smart Family and another 6 months to hand off AT&T Secure Family with some overlap. Luckily for our timeline, we had already been experimenting and testing new designs for each of the legacy platforms we were to update and combine. We also had a great deal of research about our users spanning the life of all of our products. Although we had a wealth of research from previous product launches, I lead several more runs to validate our assumptions about our users, their habits, and their needs. We interviewed over 25 parents that represented our target audience and presented our findings company-wide and to carrier partners. Not surprisingly, we found little differences between parent concerns from our recent research to our older research. Location - This becomes more important as kids gain independence in cases like walking home from school, driving, etc. After distilling user goals and concerns, we set off to define our design and business goals. We then created design principles to guide our thinking throughout the entire process. As kids grow up, parenting techniques change with them. Using the Avast Mobile Intelligence lab, we gleaned insights to help the app adapt to changing family needs over time. This is an important factor to the lifetime value of the product and user retention. Parents are busy. Leave them alone unless there’s something important to tell them. Give them insights, not data. By delivering insights with minimal effort from the parent, they can spend less time in the app and more time with their family, increasing the app’s perceived value. Allow parents to take immediate action when issues arise so they can feel confident about taking charge. This empowers parents to take control and feel like good parents. Working with a parent’s natural behavior means less user drop off. Work into their lives, don’t make them work more. 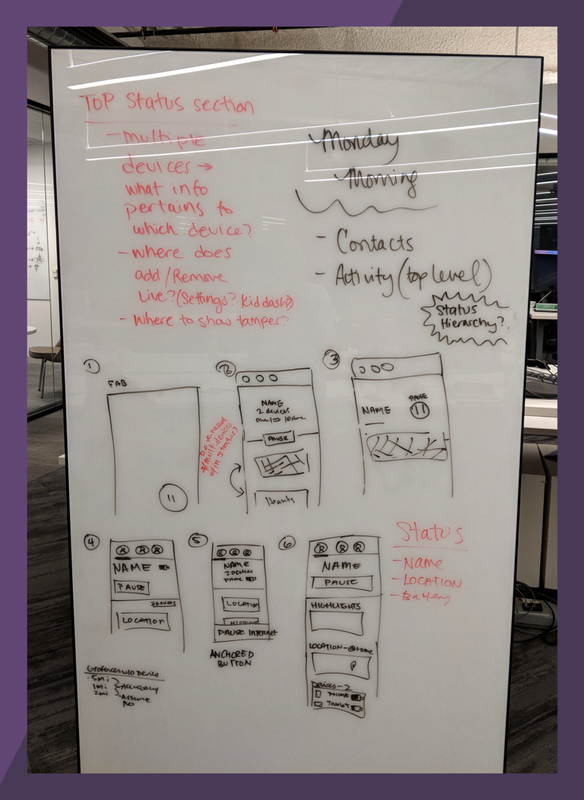 After countless hours sketching, pair designing, collaborating with engineers, and design critiques, we were ready to move forward with usability testing. We performed multiple usability testing sessions throughout our process, putting hand-drawn sketches to high fidelity prototypes in front of participants to tease out issues in flow, copy, and UI. Below, is a sketch of the 3 different navigation models we tested. We showed each one to a different participant and had them perform a task. At the end, we showed all 3 of the navigation models to them and asked for their feedback. The majority of our participants preferred the first model, which we ultimately moved forward with. Another challenge was the information hierarchy within the “status” section, illustrated in the sketch below. Again, usability testing was able to help us move forward. Figuring out the hierarchy within the “status” section. We wrapped up every session by asking our participants how they would describe the app to their friend to see which main features stuck with them. Without being primed by the value propositions we had written, we were pleased to find that the majority of our users could easily understand, repeat the main product features, and relate to moments in their lives where the product would be useful. There are a differences between the home screen of Verizon and AT&T but the basic components are the same. The image below is from Verizon Smart Family. We wanted to use the most valuable real estate to offer immediate answers to questions about a kid’s location and allows parents to pause access to the internet when their kid needs a break. New insight cards are shown every few times the parent return to the app providing details on their child’s device usage and serving as a method of passive onboarding; telling parents about other features they can use. Controls are the “set it and forget it” features that are unlikely to change often. Unlike the more dynamic highlight cards, we set them at the bottom of the screen, out of the way. We use different onboarding techniques to help parents set up more features. Both Verizon and AT&T had an established branding library and strict guidelines about use of color and iconography. Because Verizon’s color palette was mainly black and white with minimal iconography, it was an interesting challenge creating visual interest in pages and creating UI cues. AT&T was on the other side of the spectrum with lots of colors and iconography which meant being very judicious about what we used. Alongside the visual design team, we worked to create and maintain Sketch Libraries to improve design consistency and efficiency. With over 1.7 million users, we have seen an increase of 40% in daily active users from the legacy product, Verizon FamilyBase. Not only did we need to keep track of the differences between iOS and Android platforms, we needed to keep track of the differences between Verizon Smart Family and AT&T Secure Family product. Because we had such a large development team, the best way to disseminate information was to document in great detail and to hold kick-off meetings with team leads to ensure everyone was clear on what we were making. I became the key-holder for creating and updating this “source of truth” document. It’s all about documentation! Documenting product changes, design reasonings, future updates, and iterations were insurmountable to getting engineering and PM buy-in and maintaining a comprehensive catalogue of information for the entire team. It provided clarity and alignment which was helpful as we made progress.